This article builds upon what was covered in the tutorial on sending direct messages with Chatkit, so you need to go over that one first before moving on to this one. You can clone this GitHub repository and follow the instructions in the README file to get set up. We’ll be making use of the MIT Licensed Feather Icons for iconography while building this project, so I’ve added the react-feather package as an added dependency to make using the icons as easy as possible. Before you continue, make sure your Node installation is up to version 8 or later. Before we can ‘like’ an attachment, we need a way to upload them to the chat first. This section will cover how attachments work in Chatkit. First, let’s create a dialog which the user will make use of when uploading attachments. placeholder="Type your message and hit ENTER to send"
We’ve added a new upload button to the footer which toggles the file upload dialog via the toggleFileUploadDialog() method. Once the upload dialog is open, the user can add a file and an optional message about the file to the room. Note that while only JPEG and PNG files are supported in this example, Chatkit supports files of any type. Once the user hits the UPLOAD button, the uploadAttachment() method is triggered. This method uploads the attachment to the current room, creates an entry for the file in the room’s custom data property under the attachments key, and creates a likes array for the attachment. You’ll see how we’ll use this array when we add the ability to like an attachment. Notice that we’re updating the custom data on the room using the currentUser.updateRoom() method. This will not work unless the current user must has the room:update permission. 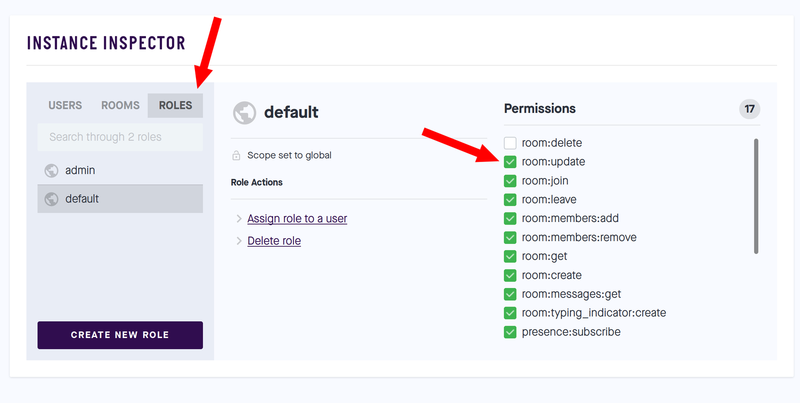 To ensure that every user has this permission, head over to the ROLES tab under Console in your Chatkit instance and update the permissions under the default role to include room:update. If you try to upload an attachment now, you will notice that although the message associated with the file is displayed, the image itself isn’t. This is because we have not added support for viewing images within the chat yet. Let’s go ahead and take care of that in the next section. If a message has an attachment, we’ll display the attachment inline with an img tag. Uploaded images should display just fine now. To like an attachment, we’ll be making use of the likes array that is present on the attachment ID in the room’s custom data object. If a user likes the image, we’ll add the user's ID to the likes array and if a user unlikes the image, the ID will be removed from the array. We’ll also be able to show the number of likes an attachment has using the length property of the array. Once, the user clicks on the like button on an image attachment, the ID of the attachment is passed to the likeImage() method and the user’s ID is added to the likes array that was created earlier when the image was originally uploaded. This causes the like button to turn blue and the number of likes to increase on the button. 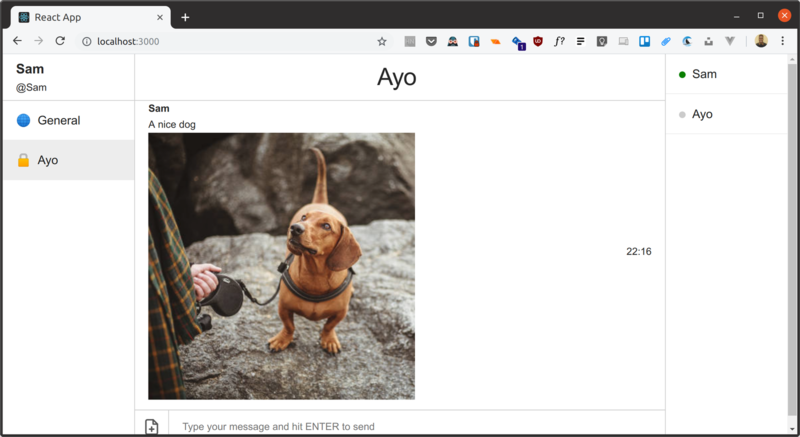 In this tutorial, we added the ability to upload image attachments, while also making it possible to like the attachments and synchronize the number of likes in realtime across all members of the chatroom. Thanks for reading. The complete source used for this tutorial can be found in this GitHub repository.